The next stage DC/DC converter that adjusts the produced DC voltage to provide correct DC levels to the battery. To meet the large capacitance values, multiple capacitors or a capacitor array is required. We recommend using our high-capacitance StackiCap 1812-4040 250V-1.2kV 100nF-5.6µF X7R capacitors for such applications. The DC link capacitor must be also able to handle twice the line frequency. Therefore, common circuit arrangements include multilayer ceramic capacitors (MLCCs) connected in parallel with other capacitor technologies to achieve this. 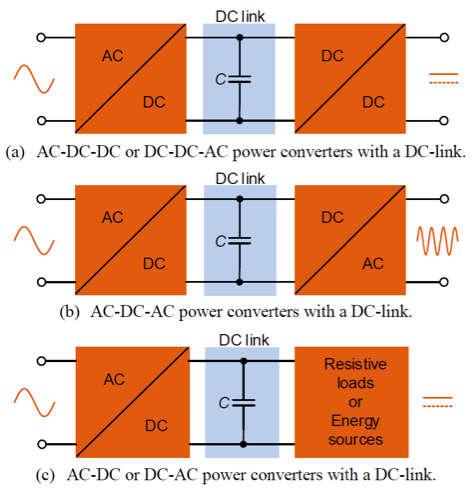 Another EV subsystem where DC link capacitors are found is the inverter in motor drive circuits (shown in Figure 3). The inverter converts DC power from the battery to three-phase AC power to drive the traction motors during acceleration, and then converts AC power back to DC during braking. It also detects the motor’s speed and position and drives the insulated-gate bipolar transistor (IGBT) power stages. In this subsystem, the DC link or smoothing capacitor Cs is placed in parallel between the DC (battery) and the AC (load) sides of the voltage inverter. The capacitor specifications are very similar to the previous OBC example, and therefore the same StackiCap X7R with high RMS current capacity is recommended. Due to the high capacitance requirements, small-sized MLCCs can be used together with film and aluminum electrolytic capacitors to integrate closer to the IGBT switching device and improve high frequency attenuation. Given the high number of converters and inverters found in EV applications, selecting the right high-voltage, high-capacitance DC link capacitor is of great importance to the overall system success. For more information, contact us to discuss your specific use case, or read our white paper Considerations for Selecting Automotive-Grade Multilayer Ceramic Capacitors in Electric Vehicles.